This wholesome rice preparation is the best comfort food to satisfy your craving buds. 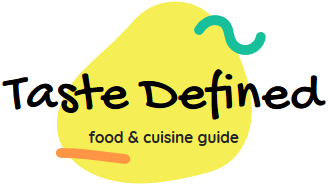 Apart from pineapple, the other veggies can be added or subtracted as per your preference. Use a generous quantity of garlic to get the best flavor. Though normal rice can be used, I'll recommend sticking with jasmine rice. These fried rice taste best when served piping hot. For a richer version, one can liberally add seafood or sausages in this rice recipe. In the winter season, nuts can also be included to enrich the preparation. I prefer to serve this fried rice with a coconut based curry or stew. You can easily make this recipe with leftover rice too. 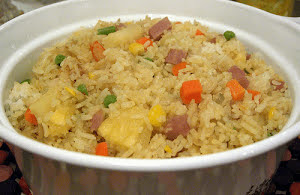 Let's make this scrumptious Thai pineapple fried rice recipe for our loved ones. Do once try this delicious and fruity Thai fried rice recipe consisting of fresh pineapple and veggies which makes it a wholesome and nutritious preparation. Heat 1 tsp of vegetable oil in a large wok. Add whipped egg and stir briskly to scramble it. After half a minute, transfer the scrambled egg to a plate. Again heat 2 tsp of vegetable oil in the same wok on a high flame. Add diced pineapple with minced garlic. Toss and stir fry for about 2 to 3 minutes. Add parboiled peas, parboiled carrot, and lightly sautéed sausage chunks to the wok. Add scrambled egg and toss again for a minute. Add cooked rice with soy sauce, fish sauce, chili sauce, and white pepper powder. Toss and stir fry for 2 minutes. Bring down the flame to medium. Add lemon juice and salt as per your taste. Toss and stir fry again for a minute.